H.E. Prime Minister Dr. Haider Al-Abadi receives Assistant Secretary-General for Political Affairs. His Excellency Prime Minister Dr. Haider Al-Abadi has received, in his Office today on Sunday, Assistant Secretary-General for Political Affairs, Miroslav Jenča, and his accompanying delegation. Dr. Haider Al-Abadi has confirmed that the government's continuous efforts to restore stability to the liberated areas and creating better conditions for encouraging and facilitating the voluntary return of IDP's and providing the protection for all citizens. His Excellency has renewed the government's commitment to the constitutional date for the holding of parliamentary elections. Mr. Miroslav Jenča has conveyed the greetings of UN Secretary-General ANTÓNIO GUTERRES, expressing his interesting in the positive developments in Iraq and the full support of the United Nations for the reconstruction and stability efforts, noting that Mr. GUTERRES will participate in the Iraq's reconstruction conference to be held in Kuwait. 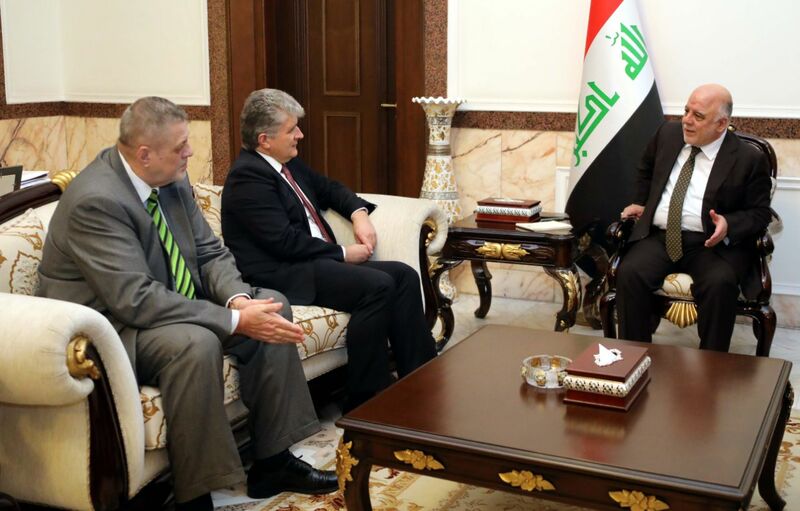 Mr. Miroslav has said that the international community is supporting Iraq and coordinating the joint efforts with the Iraqi government, which will contribute to reconstruction and stability. Mr. Miroslav has also confirmed UN support for the elections as scheduled by the government.